A couple of New York-based architectural and design firms are Kickstarting what could be the ultimate souvenir of the city—next to those tiny Statue of Libertys you can find everywhere. Imagine hanging an incredibly detailed 12-foot long model of the entire island of Manhattan on your wall. 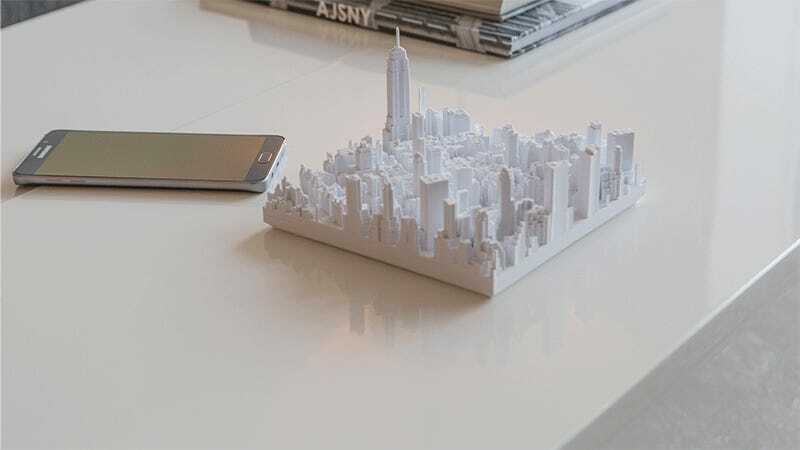 Using detailed aerial scans of the city, AJSNY and TO+WN design have created a series of 3D-printed six-inch square tiles that each represent a section of Manhattan at 1:5000-scale. And nearly every last skyscraper, building, and event space in the city appears on one of the 200 different tiles that eventually assemble to recreate the entire island of Manhattan. Most collectors will probably stick with buying just the tiles that represent the areas of Manhattan where they live, or where they’ve visited, because even with early bird pricing the tiles currently run $75 each from the microscape Kickstarter campaign. Eventually they’ll be priced at $125 each, so if you love the idea, it’s probably a good idea to pre-order a few now. However, if you have loftier ambitions in life and have always fantasized about owning one of the greatest cities in the world, you’ll be able to do so if and when the microscapes’ Kickstarter campaign is a success. The creators will then be offering a special-order version of the set that includes every last tile for $25,000. And for those of you who aren’t 100 percent convinced that New York is the greatest city on earth, if this version of the microscapes is a success, eventually other cities in the US and around the world will be miniaturized and made available on a tile-by-tile basis so you can expand your scale empire.